I was told on the first day of work that the next 8 weeks would fly by. 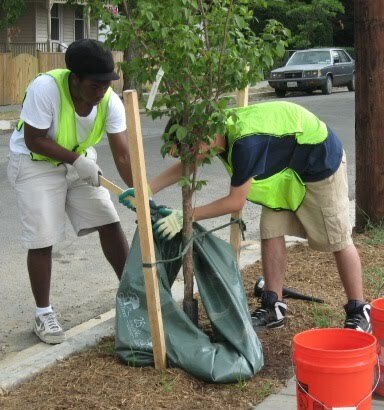 I sort of scoffed at this, and our goal of watering 2,500 trees. 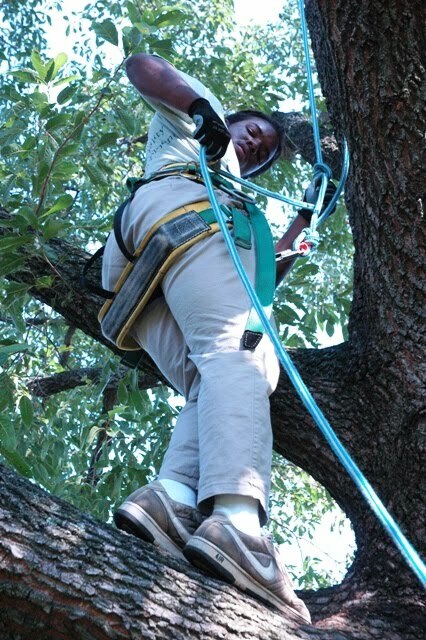 However, as I sit and write this blog entry, with almost 4,000 trees under the Summer Crew’s belt, all I can ask myself is - where did the time go? One of the most gratifying parts of this job has been being able to see the City. Living in Montgomery County, I don’t come into the City often. When I do, I am usually just passing through to Virginia. So my own little “bonus” to this gig is I get to tour the City. But as of recent that thrill of a new “adventure” everyday has been lessened. The Summer Crew has been combing through the maps at an astonishing pace. Some of the locations we were projected to only visit three to four times, we’ve hit five or six. Sometimes I have to ask Mike (both Crew Chiefs as well as myself share the same name; makes things confusing sometimes), “Didn’t we water these trees last week?” But in this oven-like weather I guess the trees need all the water they can get. A funny thing has been happening to me off the job. 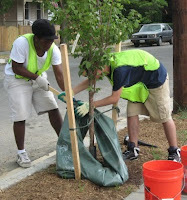 When I walk down the streets in my neighborhood all I seem to think about is how nice and big the tree boxes are for the trees, how some open areas could really use a couple of trees for shade and how accessible some fire hydrants are to trees. These thoughts never even crossed my mind before. I joke about this sometimes with the other crew members and they share their thoughts of the same nature. I don’t know if this is healthy or not but it does show I’m learning an awful lot about trees. The truth is I and everyone else on the Summer Crew work really hard. I lug forty pound buckets in record high temperatures and sweat in places I didn’t know could. But I also get a lot out of it. I’ve made friendships with kids I wouldn’t otherwise have ever met, I get to take part in an effort to really improve human lives by helping trees live and I participate in fun professional development events. Take last Friday at our tree climbing outing. 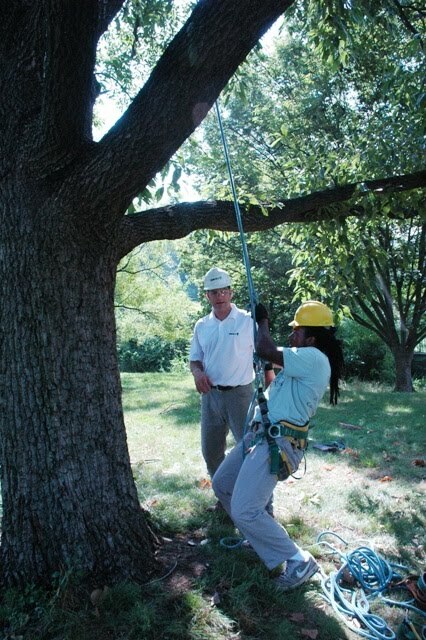 The guys from The Davey Tree Expert Company were great, and even a little funny. But the best part was, I got to climb a tree! It definitely looked a lot easier than it turned out to be. I saw some of the crew members go up before me and I asked myself why they were having so much trouble. It looked easy after all. After being strapped in my harness I learned otherwise. I pride myself on being an athlete by playing football, wrestling and being a field thrower. But before I got even halfway up the tree, my forearms and shoulders were on fire. I was tempted to ask the Davey Trees guys where to buy that equipment so I could add tree climbing to my workout. I didn’t even make it all the way up, not because of fatigue, but rather fear. Once I was a good distance up, I looked down and all I could think about was how much it would hurt if I fell. So I hustled down. For all I do for these trees to stay alive, I don’t want one killing me. Thank you for sharing your wonderful experience! I really admire people who plant trees and take time in taking care of them. Trees indeed are important to us, we should take good care of them. Kudos to you and your team! More trees to plant!